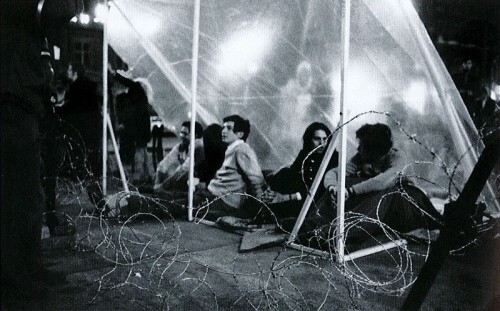 1969—A hunger strike by Jewish students on Schwarzenbergplatz in support of Jewish emigration from the Soviet Union. The University of Vienna celebrates its 650th anniversary this year, and the city’s Jewish Museum is marking the occasion with an exhibition that explores the long and tumultuous relationship between Jews and the University. After the expulsion of the Jews from Vienna in 1421, the rubble of the old synagogue was used to erect a new building for the University, where Jews wouldn’t be admitted to study until the late 18thcentury. By the 20th century, Jewish scholars had brought international luster to the University only to be forced out again by antisemitic persecution. 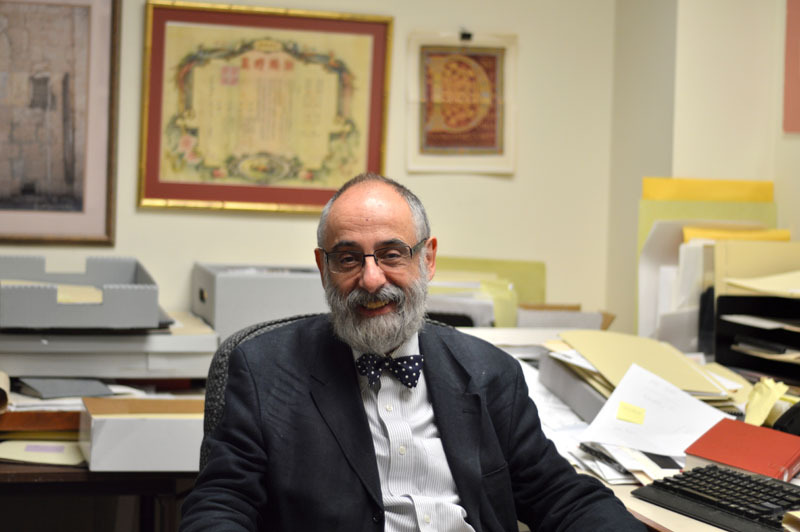 In conjunction with its exhibition, the Jewish Museum in Vienna organized a roundtable discussion about Jewish life and politics on campus during the riotous 1960s and 1970s; LBI’s own Head Archivist and University of Vienna graduate (1975) Hermann Teifer was one of the speakers. I took my oral university entrance exams on June 6, 1967, just as the Six-Day War broke out. I had family in Israel, so it hit very close to home. The exam was an afterthought. All I wanted was to get back to the radio so I could hear the news from Israel. My parents had always told me, “These Austrians are all Nazis: we don’t really live here, we are just passing through. You were born in Vienna, but you’re passing through too.” After my studies, I was expected to leave Austria. I also come from a family of leftists. My father was a Communist and my uncle was an Austromarxist. So, I was looking for a way to get involved politically, and I thought, “I know. I’ll roll up my sleeves and join the Jewish Student Union.” The Union was located in a storefront on Währinger Straße, directly across from the medical school’s Anatomical Institute. In my day, almost all of the Jewish students in Vienna were medical students from Israel. The Jewish Community had given them this storefront, where they could read newspapers and drink coffee between lectures. Around 1965, Taras Borodajkewycz, a professor at Vienna’s business school, was openly spouting Nazi views in his lectures and didn’t seem to suffer any consequences. 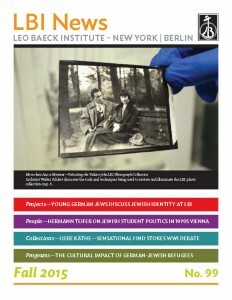 The Jewish students at the University of Vienna wondered how to react: “How can we protect ourselves? Do we need a student alliance? Should we shut ourselves in a Ghetto? Should we hit the streets and scream that we are Viennese too?” I stumbled into these discussions and, since I was what they call a Geschaftlhuber—a big talker, a busybody, a meddler—I was voted Chairman of the Jewish Student Union. My fellow students, who weren’t leftists for the most part, soon regretted it. When you walked into my Jewish Student Union, what you saw was an enormous poster of Karl Marx and above that a portrait of Theodor Herzl. Some members of the Jewish Student Union didn’t appreciate it, and relations with non-Jewish students, even and especially the leftist groups, weren’t much easier. In the early 1970s came the exodus of Russian Jews from the Soviet Union. We erected a stand in front of the University and demanded that the Soviets allow the Jews to leave. A few right-wing students, easy to recognize from their dueling scars, and a group of elegantly dressed students who turned out to be Syrians came and tried to take away our flyers and destroy them. That was the casual Austrian style of antisemitism I remember. 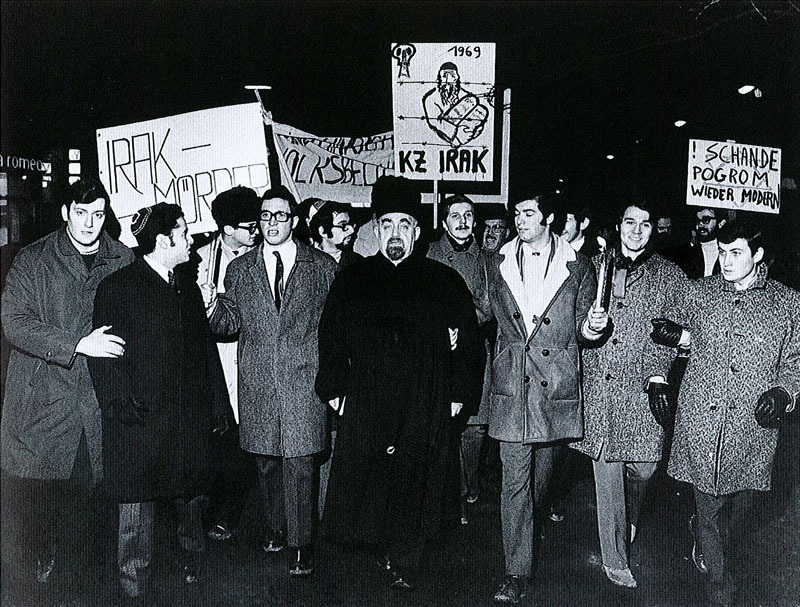 1969—Jewish students march in protest of the public hanging of 14 Jews in Baghdad. Hermann Teifer is pictured 5th from the left. The non-Jewish leftists, meanwhile, discovered their profound solidarity with the Palestinians, and we saw it as our role to present another perspective. At a rally for the Palestinians in one of the University’s large auditoriums, I introduced myself as a representative of the Union of Jewish Students only to be shouted down with a chant of “PLO! PLO!” In fact, we were the only ones arguing for a two-state solution at that time! The leftists didn’t want to hear it, and neither did many Jews in the Student Union, frankly. What can I say? In Vienna in those days, it was difficult to be a Jew. Especially one who dreamed of a socialist world. There’s an old joke about two Jews who meet after 1945. The first one asks, “What’s Cohn up to?” The second replies “Cohn is in Argentina.” – “What’s he doing there?” – “Helping to build Socialism.” – “And what about Schwarz?” – “Schwarz is in South Africa.” – “What’s he doing there?” – “Helping to build Socialism.” – “And Blau?” – “Blau is in Israel.” – “Let me guess—he’s helping to build Socialism?” – “Are you crazy? In his own country?” Well, that was exactly what I wanted to do, so after I graduated I went to Israel. When I failed to build Socialism there, I totally gave up and immigrated to America instead. Hermann Teifer was born 1949 in Vienna and studied Theater, Philosophy, Political Science, and Jewish Studies at the University of Vienna, where he earned his doctorate in 1975. He worked as a freelance author in Jerusalem and New York and raised two sons. After his sons left home he studied library science at Queens College and joined LBI as an archivist in 2008.